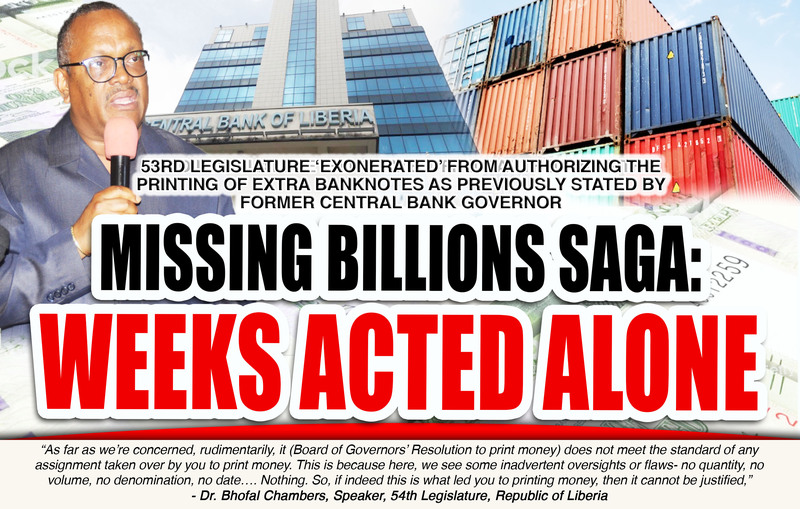 Monrovia – The House of Representatives has launched an inquiry to ascertain who authorized the printing of L$16 billion that is reportedly missing. The plenary’s decision was triggered by a motion filed by Rep. Thomas Fallah (CDC, Montserrado District#5), which came in the wake of a communication from Rep. Gray (CDC-Montserrado District #8) seeking the indulgence of plenary to invite all stakeholders involved in the printing of the money. Stakeholders include current and past officials of government including former Speaker Emmanuel Nuquay, the Central Bank of Liberia (Executive Governor Nathaniel Patray and Ex-Executive Governor Milton Weeks along with Board of Governors-past and presence and Deputy Governors), Ministry of Finance and Development Planning (Min. Samuel Tweah and Boima Kamara) and the Ministry of Justice (Cllr. Musa Dean and Cllr. Frederick Cherue) and the Liberia Revenue Authority (Commissioner General, Thomas Doe Nah and former C.G Alfreida Tamba). However, appearing before plenary on Thursday, November 8 were former Speaker Nuquay, former CBL Executive Governor Weeks, former Justice Minister Cherue and current LRA Deputy Commissioner General, Decontee King Sackie who represented LRA’s Commissioner-General Thomas Doe Nah who could not appear because of the ongoing cabinet retreat in Kakata, Margibi County. During the first-day hearing, the plenary of the House exonerated all those that appeared, except the former CBL Executive Governor, Milton Weeks. The Plenary then voted in favor of a motion by Rep. Edwin M. Snowe calling for Weeks and all those who served as members of the Board of Governors during the printing of the money to appear before the House, beginning Monday, November 12 and every other day-sitting of the re-called session until the fact is established. The Plenary’s decision was triggered after ex-Governor Weeks admitted that the CBL had already entered into agreement with Crane Currency in Sweden to print additional L$10 billion before being authorized by the Legislature to replace the legacy banknotes. He also admitted that the CBL Board of Governors’ resolution authorizing the printing of the money was marred by irregularities, and that the CBL did not inform then President Ellen Johnson Sirleaf and the Legislature prior to the printing of the bank notes; contrary to what he was told. During the hearing, Weeks told Plenary that the CBL acted based on a communication from both Houses of the Legislature authorizing the CBL to completely replace the legacy banknotes with the newly printed bank notes. That the central Bank of Liberia is hereby requested to replace the legacy notes (Liberty) completely with the newly printed bank notes so that there will be a single type of Liberian currency, thus facilitating proper control of the money supply; and that the central Bank of Liberia is authorized to introduce coins in lower denomination into the economy to allow fractional transaction which could help to minimize inflation. Former Speaker Nuquay, in his explanation, admitted that the Legislature did send the above communication to the CBL, but noted that it did not authorize the CBL to print additional banknotes. According to him, the CBL was authorized to use the remaining L$5 billion (the first batch of newly printed money the Legislature had authorized the CBL to print in 2016), and if there’s a need to print additional ones, the CBL should return to the legislature with details of the money it wanted to print. During the cross examinations, he explained that the procedures in printing banknotes begins with the Legislature who authorized the Executive and the Executive will in terms inform the CBL. However, following the communication from the Legislature, the CBL printed L$10 billion dollars at the cost of US$10.4 million from the CBL reserve to replace the legacy banknotes. He added that due the budgetary constraint, the national budget could not support the printing cost. He revealed that Crane currency was selected after a competitive bidding process to print all of the banknotes in Sweden and shipped to Liberia between October 2017 and early 2018 via air and sea. This was backed by the LRA Deputy Commissioner General who revealed that the LRA was aware of 25 20-foot containers of money, but because of security implications, LRA was not told of the total volume of the money. Weeks also clarified that Crane could not print the exact replica of the old notes as it did not have the printing right, noting that a French company who printed the legacy notes had the exclusive right. “Crane could not print the exact replica of the old notes. Therefore, we agreed that the major features on the note will remain, but the notes will be slightly altered in appearance to avoid infringement,” he said. With regard as to why the CBL did not quickly replace the legacy notes with the new notes, Weeks said the CBL decided to gradually replace the legacy notes to ensure there is no shock in the system. When questioned by Speaker Chambers as to what instrument guided the bank to print the money, Weeks indicated that it was the CBL Board’s resolution. However, when the resolution was read in Plenary by Deputy Chief Clerk, Sayfah Geplay, the Speaker declared that the CBL Board’s resolution was flawed and marred by irregularities, something that Weeks admitted to, nothing it was an oversight. “As far as we’re concerned, rudimentarily, it (Board of Governors’ resolution to print money) does not meet the standard of any assignment taken over by you to print money. This is because here, we see some inadvertent oversights or flaws- no quantity, no volume, no denomination, no date…. Nothing. So, if indeed this is what led you to printing money, then it cannot be justified,” he said. The former CBL boss also admitted that he did not inform the then president Sirleaf prior to printing of the money; contrary to what the former president has requested. As for entering into agreement before being authorized to replace the legacy bank notes, he defended that it was a strategy to print the money on time. Following Weeks’ cross-examination by the Speaker, temper flared amongst most of the lawmakers as they blamed Weeks and his Board of Governors for being responsible for the alleged missing L$16 billion saga that has brought the Legislature to public disrepute and damage the image of the country. When asked by Rep. Kaine Wesso of Gbarpolu County as to whether he takes the blame for his actions, he vehemently refused on grounds that he did not act alone; rather it was the action of the Board of Governors of the CBL. Rep. Gray termed his response as reckless and termed his action as administrative ineptitude. Rep Snowe call for a criminal investigation, instead of a legislative inquiry. “To stand here today and give us a Board resolution without date, without resolution number, without the amount and said that it constitutes a constitutional authority, Mr. Presiding, it’s time that this matter be changed from a legislative inquiry to a criminal investigation and people must go to jail and be held liable for their actions,” Rep. Edwin M. Snowe urged. However, Speaker Chambers pleaded for calm and Rep. Snowe filed in his motion of summon. Following series of amendments, the Plenary voted to summon the Ex- CBL Governor along with his Board of Governors to continue with the hearing. Cllr. 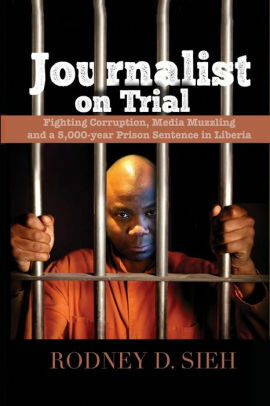 Cherue was exonerated after he had no idea of printing money while serving as Minister of Justice.